I swear we feed them. I never hid food as a kid, but then, I have only one sister. 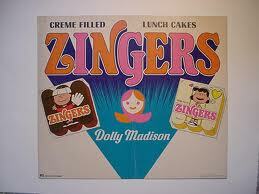 If my mom brought a box of Zingers or Jello Pudding Pops home, we were guaranteed to get one. Hell, more than one. More often than not, exactly half the box for each of us. Not so in my current family. A regular-sized box of anything isn’t big enough for all the kids. We buy in bulk wherever possible, and buy multiples when it isn’t. Even if the numbers work out, no one is guaranteed an equal share. We don’t run our house as a democracy, nor as a commune. It’s a benign dictatorship with a flourishing black market. Any treat we buy is immediately, surreptitiously pillaged and hidden. #5, being little, likes to tell me his hiding places. Sometimes he asks if it’s okay. I haven’t figured out if he’s cute, or if he’s trying to distract me from his more sinister master plan. But occasionally, I hide things on his behalf, because what are the odds that an eight-year-old boy can come up with a hiding place that his four older sisters haven’t found before him, and won’t think of in the future? I get mad when they hide things to the extent that one kid gets all of them. I also get pissed when they hide something successfully and forget about it, and I find it months later with a green/blue spray of mold across it or else fused to the inside of an appliance we rarely use. Sometimes one kid finds another kid’s stash, takes a bite and returns it to its hiding place. The pantry is a minefield of half-open wrappers with one bite missing. Likewise the freezer. I come across hidden treats when I’m packing lunches or pretending to cook. What I do with them depends on my mood and where I find them. And if it was anything I wanted for myself to begin with. This morning I found someone’s half-eaten bag of Sour Patch Kids. It’s now a three-quarters-eaten bag of Sour Patch Kids. UPDATE: It is now a bag containing four Sour Patch Kids. UPDATE: #1 just declared in a very loud and sarcastic voice while we were standing in the kitchen, “Oh no, I knew that was a bad place to hide my Sour Patch Kids.” I pretended not to hear her. We pay allowance. Not much: 50 cents per year of age, per week. I don’t pay on time. I currently owe them about three hundred dollars. They spend most of their money on food: Ramen. Nutella. Marshmallow Fluff. Frozen chocolate chip waffles. Brownie mix. Donuts. Icing. Soda. Lemon Juice (yes, lemon juice). CC makes them share any and all candy, even if they buy it with their own money, but somehow there’s a loophole around everything else. They’re not supposed to keep food in their rooms for the obvious reasons, so it’s all about how to make sure nobody else gets their treats. In addition to the hiding, there are threats, fair trades, bargaining, and diversion. Still, they steal like mad. They steal from each other and then when they discover that their own treat, purchased with their own money, has been decimated, they are indignant. And I’m forced to point out the fallacy of their argument, namely that they can’t complain about the loss when they’re thieving themselves. This makes me incredibly popular, as you might imagine. Posted on April 12, 2011 April 12, 2011 by JM RandolphPosted in Ha, The Heathens, YumTagged family, food, kids, parenting, step parenting. They know better because you raised them right! I licked the spout. That made my day. I’m trying to find a way to work that into more daily conversations. 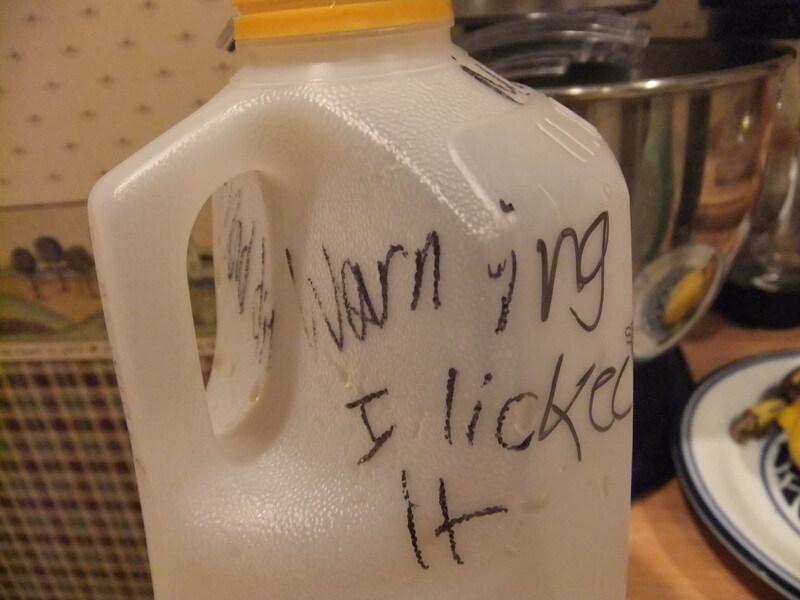 Hmm…if I saw a container with that message I’d immediately blame my husband. After reading this, I truly feel for you. I only have the two kids and the food situation is crazy. They like to hoard things for later. If I’m in the shower and I hear a kitchen chair being dragged across the floor, I know that my daughter is taking something out of the fridge and hiding it. I once found a half-frozen hamburger patty in her backpack. That’s hilarious. Was it cooked-frozen or raw-frozen? You are not alone, but you are a hoot! I’m one of three, and in my early twenties, my mom and I discovered a package of yodels in the telephone stand – they were so old they were petrified. No mold, no stench. Kind of like the McDonald’s french fries you find in your car a year later. Lively debates about who hid them there still rage on. Oh my. That’s fantastic! I do hope you kept them. They could be the re-gifted item in your family for all eternity. WARNING I sneezed on both pizzas! I’m so lucky I never had to go through this (having only 1 sister), but love it. (I did have to do it when a certain friend came to my apartment to visit though). It teaches them to be creative. 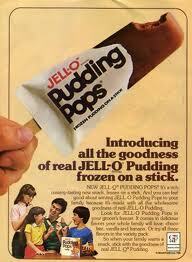 But I have to admit, I only had half my brain in the story after I saw Pudding Pops. I loved Pudding Pops and you can’t find them anymore which ruins my day on a regular basis. Yeah, I think Pop-sicle took them over, at least briefly, but they are Not. The. Same. At all. LMAO …. hilarious. I am a hider. Because my kids are stealers. They like everything. I am running out of hiding places. So I have been forced to eat at midnight. My thighs are suffering! I eat at midnight too. I sympathize. My mom would hide chocolate around the house when we were kids. My sister and I once endured an Inquisition-caliber ordeal to uncover who had consumed a Cadbury bar. Of course it was a Cadbury bar! Which one of you did it? LOL!!! I’m way behind on allowance payments too!!!!!!! Thank God they can’t garnish our wages! Yeah, I’d be in big trouble. This is great. As a child, I wouldn’t have been put off by the “I liked the spout” warning. That kind of stuff never freaked me which is why I am at an advantage at my house. I don’t think twice before finishing someone’s soda or half eaten sandwhich. I go there…often. Would you eat the pizzas that the guy up there sneezed on? Cause if so, I think you win. LMAO! This is too funny. I hide food too, just not from my 5 year old at the moment. I am generally hiding from the other adult in the house since he thinks that everything I buy is also for him (then proceeds to eat it ALL & leave nothing for the buyer!) – thus ticking me off that I have resorted to hiding. i keep my gummi candy hidden from my just-turned-four-year-old… for obvious reasons. I like the pocketmoney formula – I was wondering how to work that out! I don’t think $8 for a 16 year-old sounds like much though 😦 I may have to adjust the rate per year of age. But I like the logic! They steal stuff? Hmmmmmmmm – I’ll have to watch out for that! It’s not much for the teens, but that gives a little motivation to do some babysitting or get a part time job, that kind of thing. Aw, moldy chocolates make me sad. LOL! I love it! My human says his two kids would hide food. The worst occasion was when one of them decided to stash a whole Christmas Stocking full of candy in the oven. It was supposed to be temporary but……. Have tried cleaning a pound of rock candy mixed with a half-pound of chocklate from a preheated oven? Don’t! Hahaha… hilarious! Your matter-of-fact voice only adds to the comedy of your piece. I also love how you describe your family as a benign dictatorship. Having grown up with two siblings in what can only be called a true democracy, I really enjoyed this episode. Thanks for sharing! Thanks also for stopping by my blog — I know it has been a while, but I blame it on unforeseen forces pulling me in too many directions for my late appearnce here :). I took to hiding the candy I bought with my own money in my room because it wasn’t even my sister who would eat it – it was my dad. With only two kids though, it was pretty easy to parcel off things and when we got older it turned into more of a fend for yourself attitude. We fought over who got the last pizza pop all the time though. My mom had pretty strict limits on the amount of junk we could eat though and really didn’t keep that much of it in the house to begin with. Here’s hoping my kids are as good as my sister and I were about it. Dads are the worst. Way too sneaky. That is hilarious. I’m so glad I found your blog. I have picky eaters and almost wish they would care about food enough to go to the pains to hide it. I was relieved to find that no one in your house is hiding jello pudding pops…although I’m not 100% sure they are capable of melting. What’s in those things anyway?? Sugar, and lots of chemical-sounding things that have the word “gum” after them. My husband and I bought a lock for our bedroom door and any time we are out of the house, the door gets locked. We’ve also had to resort to a dorm room-sized fridge for things like milk and cheese that we use frequently for meals because the our 3 kids will eat everything but the plastic if we leave stuff in the kitchen. Apparently our oldest will even sneak raw potatoes and salt, take them down to his room and eat them like apples.